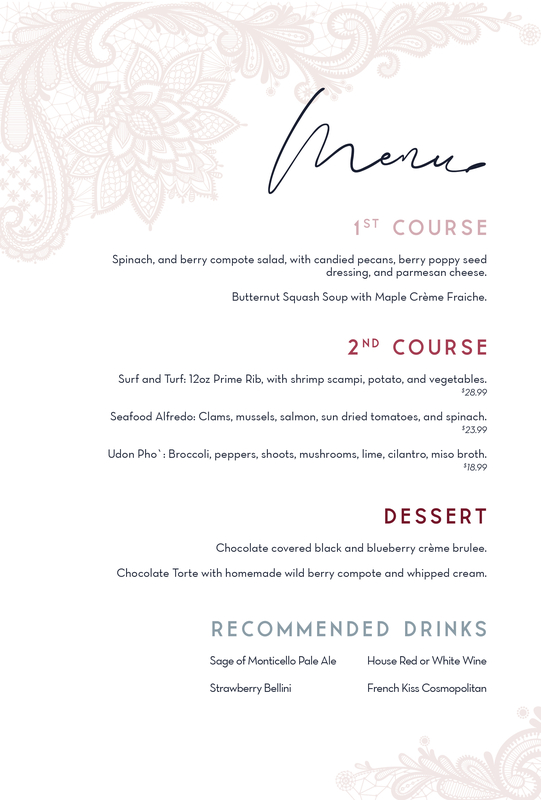 Our Valentine's Menu is ready! Served Valentine's Day only Thursday, Feb. 14 from 4 pm to 7:30 pm. Reservations are HIGHLY SUGGESTED! Give us a call at 605-673-4477 to make your reservation. Dinner includes your choice of champagne, wine, beer or cocktail as well! Included with Valentine's Dinner is your choice of Champagne, Wine, Beer or a Cocktail! This email was sent from http://www.buglinbull.com to brian.j.boyer@gmail.com. You are receiving this because you joined our mailing list or opted to receive email notifications from us when you registered on our website. If you wish to no longer receive email from us, you may safely unsubscribe from our mailing list at any time.